As befitted its would-be hegemonic status as self-proclaimed global exemplar, the Federated States of Natonia prided itself in its ability to fight Two-And-A-Half-Wars at a time. No one ever thought that it would need to fight two-and-a-half wars, of course. For the designers of Natonian grand strategy, however, it had always seemed that One War at a time was insufficient ambition for such a righteous superpower, Two was better, while Three Wars at a time was just a little too conceited. Pretty much everyone agreed that Four Wars was right out. Thus it was that Doctrine 2.5W was born. It was mentioned in a great many speeches, especially by members of the Joint Chiefs of Staff at budget appropriation time. Defense contractors loved it too. Allies sheltered under its protective embrace, able to divert their own budgets to provide such things as responsible national health care. A glossy version was even brought out for public consumption by the University of Natonia Press. As it turned out, however, Natonia’s intervention in South Dakkastan would set in motion a series of events that would ultimately put its claim of global warfighting capability to the test. As Natonian forces found themselves committed ever deeper into that conflict, a long-simmering crisis half way around the world exploded. On the divided Norkean Peninsula, the East Norkeans took advantage of Natonia’s distraction to launch a major invasion of longtime Natonian ally, West Norkea. 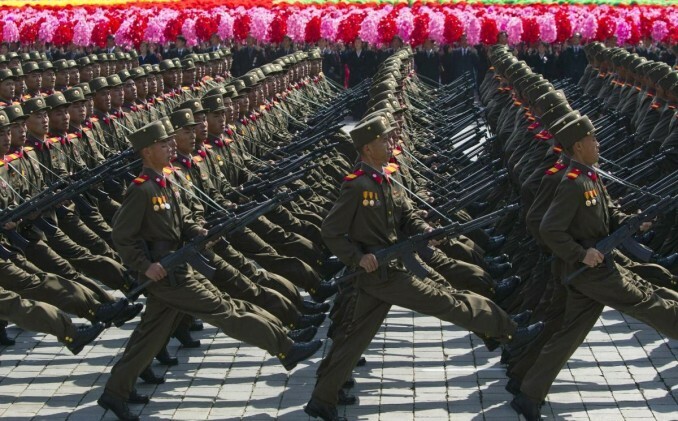 A military parade by East Norkean troops, celebrating “Crimson Chrysanthemum Day of Glorious Designer Bri-An Tra-In and His Many Game Designs Which Cause the Imperialists To Cower Like Fearful Dogs” day. This wasn’t the first time the two sides had fought: a previous conflict half a century ago had ended in a bloody draw. Since then, the East Norkeans had devoted themselves to building up both a large and rather fanatical army, and an equally impressive cult of personality around their leader Bri-An Tra-In (known to all East Norkean school children as the “Great Designer.”) What the East Norkean military lacked in modern equipment it more than made up in discipline: underperforming military commanders were routinely executed or, even worse, sent to reeducation camps where they were fed a constant diet of Tra-Inist propaganda (and little else). Under his leadership East Norkea had also developed its own arsenal of both chemical and nuclear weapons, and had emerged as a major ally of South Dakkastan (the so-called “Axis Of Bad Guys”). West Norkea, by contrast, had developed into a thriving industrialized democracy and a global video game great power. In order to deter any aggression by the East against the West, elements of Natonia’s 2nd Mechanized Infantry Division had long been deployed near the border to act as a trip-wire of sorts. The West Norkean military was also quite large and modern, although smaller than that of the East. 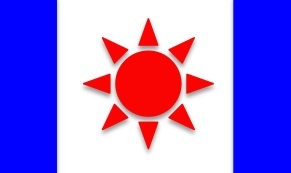 Outraged by the naked aggression of the war-mongering imperialists against South Dakkastan, and believing the Federated States of Natonia to be overstretched, the Great Designer has ordered The Glorious People’s Revolutionary Patriotic Army of East Norkea to cross the demilitarized zone and overrun the West. In sector X, two heavily-outnumbered companies of Natonian forces (augmented by stragglers from other units and some West Norkean military police) are attempting to hold back hordes of East Norkean troops long enough to allow refugees to flee and reinforcements to arrive. Critical to doing so will be retaining control over the strategic bridge at Namgang. The East Norkeans field older equipment (largely a mix of T-72s and T-55s), with a substantial number of infantry (in BMPs or trucks), and extensive artillery support. The Natonian forces are equipped with M1A2 Abrams, M2A2 Bradleys, and Strykers. They have some artillery support, and general (although not unchallenged) air superiority. Looking east across the River Namgang, showing the town, the two bridges, the highway, and the rail line. Most of the area is farmland in a sloping valley, and hilltops are often wooded. A large chemical plant can be seen in the centre of the table. 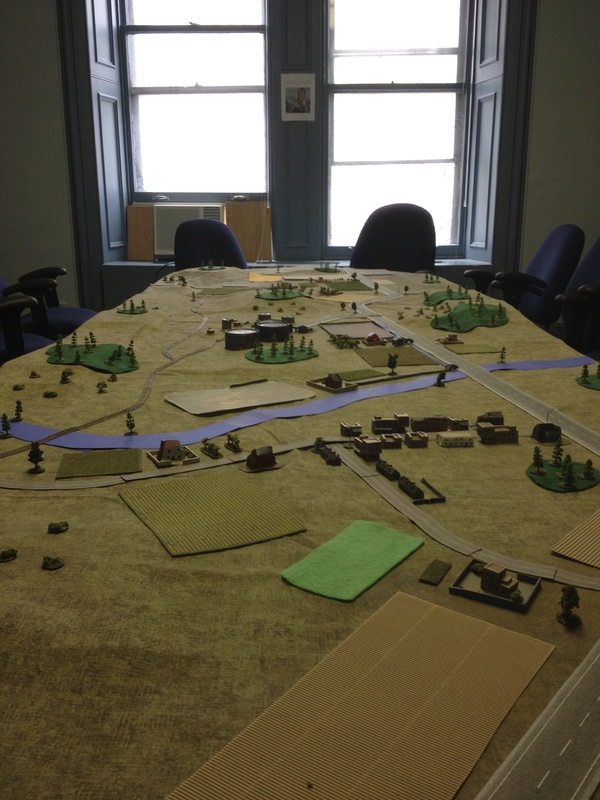 The table itself covers an area equivalent to 2.5 x 7.0 km. Oh, it’s on, Running Dogs, it’s on!